Prior to being promoted in 2016 to his current role as Director, Land Equipment, General Robert Talbot Rice was Head of Armoured Vehicles in Defence Equipment and Support since November 2011, in which role he was promoted to Major General in 2014. He is responsible for the procurement of new armoured vehicles, including AJAX, the Warrior Capability Sustainment Programme, and Challenger 2 Life Extension Programme. He also supports existing armoured vehicles (such as Challenger 2, CVR(T), Viking, Panther and Bulldog) and artillery systems including AS90 and MLRS. Commissioned into the Welsh Guards in 1983, he commanded the 1st Battalion Welsh Guards from 2002-4. His operational service includes four tours in Northern Ireland (including company command in Crossmaglen and battalion command in Londonderry); command of the British Battlegroup in Bosnia; and tours on the staff in Kosovo (in Headquarters KFOR, J5 Campaign Plans) and Iraq (in General Petreaus’s headquarters as the chief liaison officer to the Iraqi Ministry of Defence). 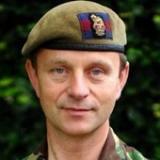 As a staff officer he served in a range of planning and acquisition appointments, including Assistant Director Equipment Programme as the sponsor for the Army’s core Ground Manoeuvre equipment. Before taking up his current appointment he was Director Equipment in Army Headquarters, responsible for the efficient management of the majority of equipment used in the Land Environment across all three services. Check out the incredible speaker line-up to see who will be joining Major General Robert.